Winner of four 2010 Tony Awards including Best Musical, MEMPHIS features a Tony-winning book by Joe DiPietro (I Love You, You're Perfect, Now Change) and a Tony-winning original score with music by Bon Jovi founding member David Bryan. Directing is Tony nominee Christopher Ashley (Xanadu), and choreography is by Sergio Trujillo (Jersey Boys). Get ready to experience Broadway's most exciting new destination and what AP calls "The very essence of what a Broadway musical should be." Christopher Ashley directed a cast that included Bryan Fenkart, Felicia Boswell, Rhett George, Julie Johnson, Horace V. Rogers, William Parry, and Will Mann. When the cast lines the stage in gold outfits and kicks out the anthem “Don’t let anyone steal your rock ‘n’ roll” and utters those deathless lines of poetry “Na, na, na, na, na, na, na, na, ” it’s a joyous validation for the Boomers that their rebellious embrace of “that music” a half-century ago was right all along. This Broadway Across America tour at the Arsht Center still gets the crowd on its feet long before the dictates of the now-standard South Florida Standing Ovation. 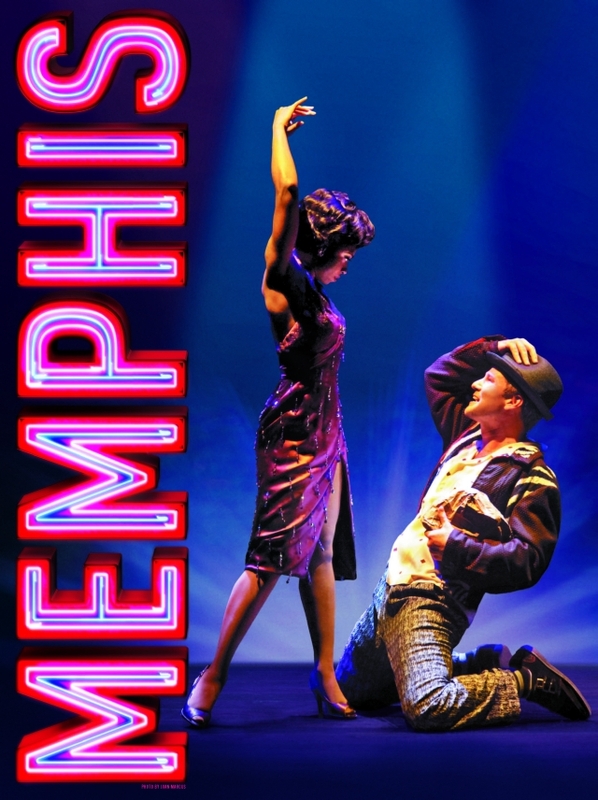 Essential to a successful production of Memphis is the casting of the two leads and the production has had phenomenal luck finding performer after performer to succeed each other in these roles that require not just strong singing chops but scorching charisma. This round, Huey is played by Bryan Fenkart who was a stand-by in the Broadway production. Sporting a molasses drawl, Fenkart exudes the blinding and blinded enthusiasm of this illiterate social misfit who finally finds something he’s good at. Another major asset is Trujillo’s period choreography executed by a troupe that effortlessly glides, slides and spins. Side note: Like most entries in Broadway Across America’s tours in Miami, Memphis is only at the Arsht for a week. We don’t know how well the shows are selling, so the economics may be prohibitive. But we wish shows would settle in for a longer run. Memphis, the 2010 Tony winner for best musical, reveals its big, dumb heart early on in its brief run at the Adrienne Arsht Center. Huey Calhoun (played with goofball charm by Bryan Fenkart) is an idealistic white boy in deeply-segregated Memphis of the early 1950s who is drawn to the soulful, electrifying music he hears streaming out of an all-black club, Delray’s, on Memphis’ famed Beale Street. Joe DiPietro’s book and David Bryan’s lyrics predictably push familiar buttons without ever really tapping emotions. Christopher Ashley’s hurried direction doesn't build tension. Bryan, keyboardist for popular New Jersey rock band Bon Jovi, composes facsimiles of R&B for Memphis that, like Bon Jovi’s rock music, is entertaining in a pinch. Unlike Bon Jovi, however, Memphis is graced with some amazing vocal talent that erupts out of nowhere on David Gallo’s multilevel set. ...Gator (Rhett George), traumatized into silence by his father’s lynching, suddenly finds his voice on the rousing anthem, Say a Prayer, as he lets loose with a sustained, pitch-perfect note. Mama Gladys (Julie Johnson), largely a cartoon, unleashes some voice-shredding testifying on Change Don’t Come Easy that would challenge Aretha Franklin in her prime. Boswell is a first-rate vocalist, especially on the smoldering Colored Woman and commercial Someday. ... let me be the first to urge you to drop everything and jump on the first bus, train or plane and get on up to Orlando, the show's next tour stop. Don't walk. Run if you want to catch a musical that personifies excellence in every facet. Even if R and B and Rock n Roll make your eyeballs vibrate in fury you're just going to have to love this piece. And I don't just mean the music, the singing, the dancing, the choreography, the acting, the directing. How about those slick as whale scales scene changes? The sets themselves? The lighting? The sound? You want fifties costumes, pony tails and bobby sox? You want every cliché in the book? Black girl, white boy, racist violence? It's all there. Not to go overboard on Memphis, (too late), but here's a nosegay or two for the performers. How about simply terrific? Don't stop, I love it? The leads, Bryan Fenkart as Huey the white DJ and Felicia Boswell as Felicia the black singer. Horace V. Rogers as Delray, Felicia's brother and Rhett George as Gator and Will Mann as Bobby, his buddies. William Parry as radio station owner Mr Simmons. And Julie Johnson as Mama, who in an evening of show stoppers cracks the joint wide open. Twenty-nine people in the cast and nine in the orchestra and, you know, I didn't see or hear a weak link. A must mention here of the excellent direction of Christopher Ashley and the spectacular choreography of Sergio Trujillo. As to the rest of the production team? I left the theatre wondering how do they do that? Mount what seems a flawless show.